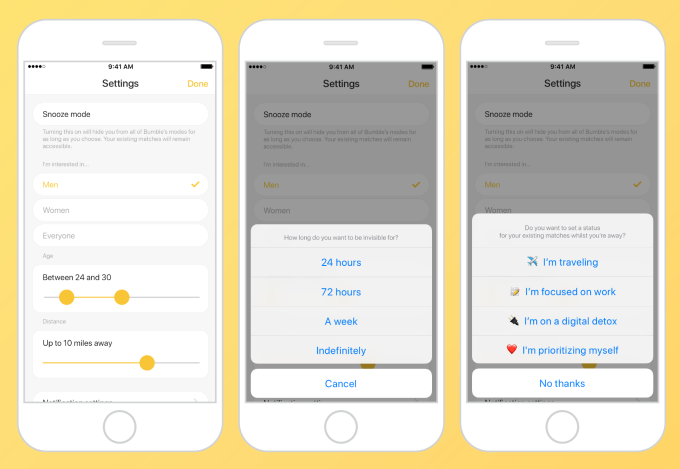 Bumble is launching a ‘Snooze’ button that will enable users to turn off swiping for a day, three days, a week or until they reactivate. They will be able to set an out-of-office style message so their matches do not think they are being rude. This can signal that they are travelling, taking a digital detox, focusing on work or prioritising themselves. In a blog post, Whitney Wolfe Herd says: “Social media has become a part of my routine, so much so that I find myself drifting in and out of those apps unconsciously and maybe, if I’m honest with myself, addictively. TechCrunch notes that the feature may help to reduce user churn by preventing burnout. It also fits well will the option to turn off Bumble Date to focus on networking and BFF. Facebook, Google and other tech giants have been implementing Time Well Spent product improvements as the movement has gained momentum. Former Google Design Ethicist Tristan Harris and his Center for Humane Technology are driving much of the change.